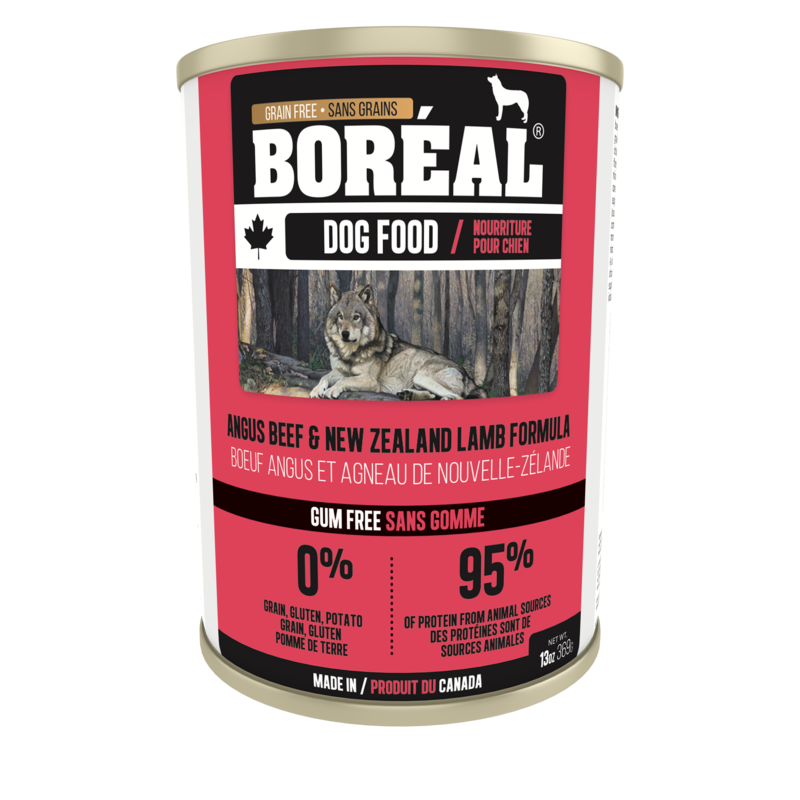 Our new reformulated Boréal Canadian canned dog foods have 95% of the protein from Meat/Fish and are designed to have almost no carbohydrates or starches. Our goal is to lower your pet's risk of unwanted weight gain. 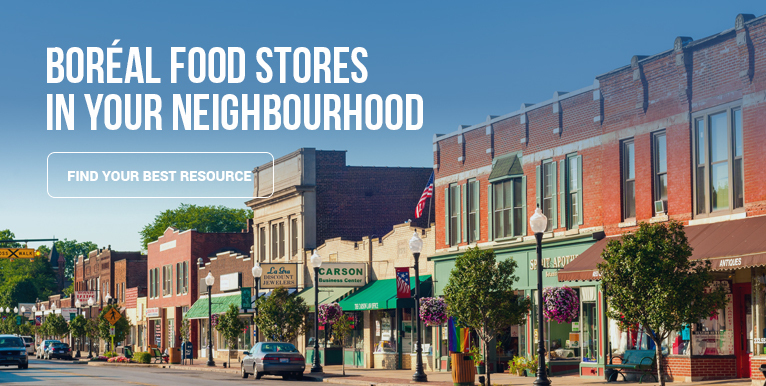 Our Canadian-made line is gum free and gluten free. 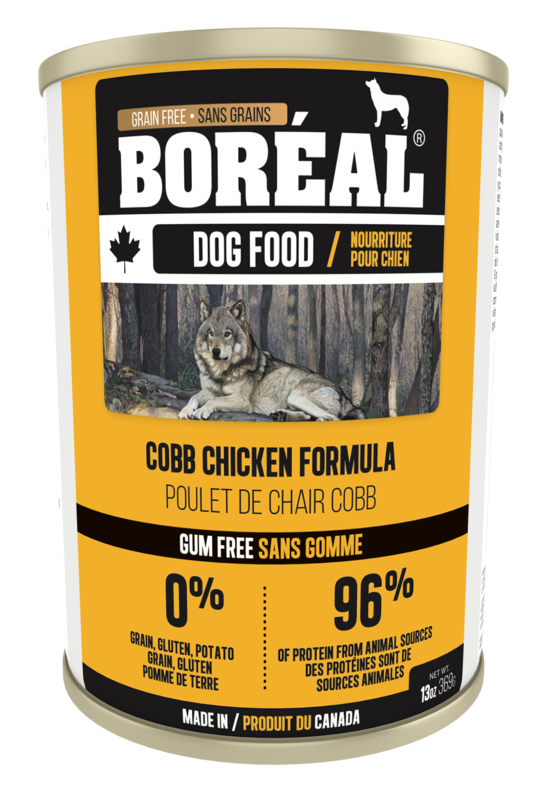 Our Cobb Chicken and Angus Beef dog food is made from Canadian chicken and beef. No cereals, grains, artificial colour, gums or thickeners added. We add Availa-Pet as it is the most easily absorbed and utilized trace mineral product available. It is specially formulated for companion animals and is more ‘bio-available’ than other forms of zinc, iron and manganese. Zinc and manganese are important for skin health and coat quality. This includes better hair coat length and shine, and enhanced skin integrity and wound healing. Zinc, manganese and iron all contribute to the growth and development of pets including weight gain in puppies, bone development and joint maintenance and repair. Cans 369 gm (13oz) and 566 gm (20 oz) Cans are BPA and Epoxy-free. Chicken, Beef, Beef Liver, Beef Broth, Chicken Liver, Whole Egg, Peas, Beans, Carrots, Calcium Carbonate, Canola Oil, Flaxseed, Monosodium Phosphate, Salt, Choline Chloride, Potassium Chloride, Yucca Schidigera Extract, Pea Fiber, Dried Celery, Dried Tomatoes, Dried Blueberries, Dried Blackberries, Dried Apples, Dried Pomegranate, Dried Cranberries, Zinc Amino Acid Complex, Vitamin E Supplement , L-ascorbyl-2-polyphosphate (Source Of Vitamin C), Ferrous Sulfate, Zinc Sulfate, Iron Amino Acid Complex, Copper Proteinate, Thiamine Mononitrate, Sodium Selenite, Niacin Supplement, D-calcium Pantothenate, Vitamin A Supplement, Manganese Sulfate, Riboflavin Supplement, Manganese Amino Acid Complex, Vitamin D3 Supplement, Vitamin B12 Supplement, Pyridoxine Hydrochloride, Calcium Iodate, Folic Acid. •For Puppies add up to two times the adult feeding rate. For lactating/gestating females add up to three times the adult feeding rate. 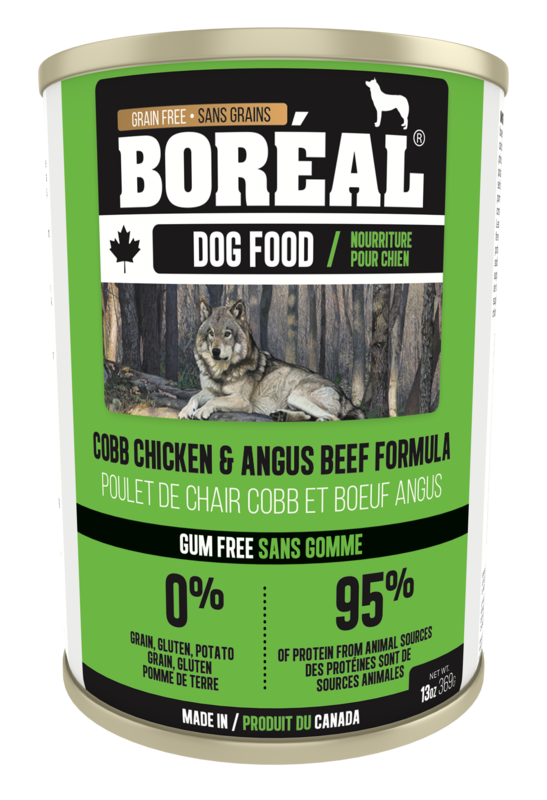 Boréal dog food is formulated to meet the nutritional levels established by the AAFCO dog food nutrient profiles for all life stages , Boréal dog food is a complete diet. Availa pet® is the trademark of the Zinpro Corporation.